Night shift detective Renée Ballard is typing up her report on her investigation of a woman found dead, after days in her bathtub, earlier that night, when she notices a stranger going through the file cabinets on the other side of the detective bureau. He's Harry Bosch, and when Bosch goes off with the shift commander, Ballard isn't convinced by his explanation. A quick examination of her own and she knows Bosch lied about what he was doing, and her curiosity is piqued by what his real motives were. 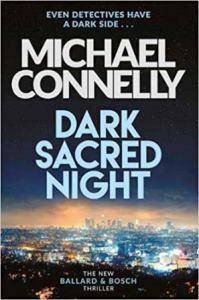 It's a brilliantly understated introduction of the two detectives Michael Connelly brings together in Dark Sacred Night. When I reviewed Ballard's debut, The Late Show, last year I wrote that “Ballard is too good a character not to reappear soon, and Connelly is too good a series writer not to draw Harry Bosch into her orbit,” and so it happened. I had interviewed Michael at Waterstone's Piccadilly on that book tour, and when I asked about comparisons between the two, he said he thought of each in terms of one key word: for Ballard 'fierce' and for Bosch 'relentless'. He repeats those definitions in a short introduction to this novel, which describes his decision to tell the story primarily separately, letting us see each character through the other's eyes. Connelly does this so well the introduction is barely required. It's sometimes overlooked, in the depth of the Bosch characterisation, just how strong the police procedural element of his stories is, and with Ballard working her night cases while joining Bosch in his relentless probing into a cold case murder. That is the killing of Daisy Clayton, the runaway daughter of a junkie Bosch met in Two Kinds Of Truth, while working undercover on the prescription opioid trade; and the mother/junkie is now living in Bosch's house. Bosch also has another cold case warming on the burner for his employer, the San Fernando PD, the assassination of a Latino gang leader a decade and a half before. Connelly mixes these stories like a magician, but the aim is not to distract, but to put the reader more fully into the mindset of the characters. The pace is as relentless as Harry, and you are left wondering, above all else, how either her or Ballard ever get any sleep. This is what keeps, and always has kept, Connelly's work above mere gimmickry, and it comes from his understanding of those personalities he has defined in one word. As doggedly as either of them, he builds their characters through the work they do, indeed the work by which they would probably define themselves. Interviewing Michael, I asked about some of the parallels I found between them: the loss of one parent, the absence of the other; the living in a metaphorically isolated location with a tremendous view: Bosch's of the city, Ballard's of the ocean, a view that is always the same but always changing. It is not surprising that they should be drawn together, that cases should be solved, that one would save the other's life, and that there might be some tragedy and sadness involved. This is what Connelly and Bosch have always been about. If, in the end, their 'formal' agreement to work together again seems a little bit too light or contrived, it is already something to look forward to. And I would not be at all surprised to find Mickey Haller being the agency that brings Bosch and Ballard together again. In the meantime, this is a must-read detective novel, for this or any year.